On April 13, 2018, in commemoration of the breakout of the Lebanese Civil War (1975-1990), ACT launched an online map of memory, which aims to shed the light on locations and events that have become symbolic elements of Lebanon’s traumatic past. 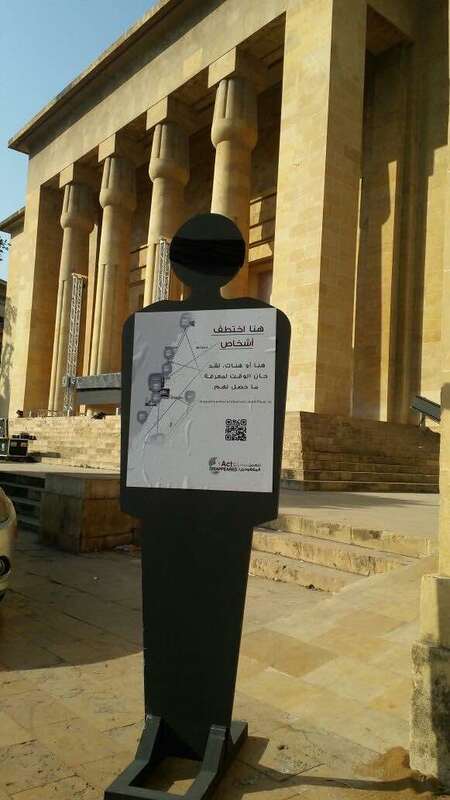 On this occasion, ACT installed three-dimensional figures representing the disappeared in 35 different places in Beirut and the suburbs where people were kidnapped. Each figure beared the following message: “People were abducted here. Here or there, it is time to know what happened to them”. The objective was not to stigmatize the area or a group of people, simply because of acts committed by individuals or groups taking part in the war. On the contrary, the objective was to move beyond the differences and to closely cooperate in searching for the truth. For the duration of the campaign, a bus toured Beirut and its suburbs, and stoped in several neighborhoods where residents were invited to embark and check out the memory map showing memorials and places reminding us of the war, as well as information and testimonies.